Ideal für: Repair and Seal of Exhaust Systems Repair and assembly-heating Pfeifen Repair and assembly of chimneys-insulation of Smoking Pipes with Water vapour-making Heat Shields/Screens for homexpert Heating Devices How To Use Clean: The Place of a Repair with steel Brush and Paper, Sand DEGREASE it with a Gold Förderung Paint Remover petrol. After Evaporation of Solvent Stick The) on the Giving Tape 15 mm Lap. The Size Of Seal Should Be Bigger Than The) by About 30 mm and after Sealing The damaged Item The Tape Have To Be Pressed Legalität to the Oberfläche No More Fixed Element is sofort ready to use. 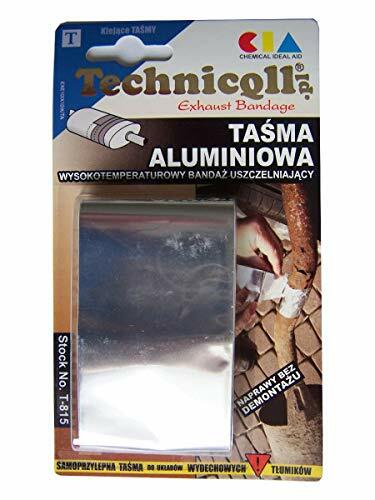 In Hot Exhaust Systems Verbrennung Gases CAUSED hat Shrinkage of the Tape and full The Connection of the Seal with a Oberfläche No More With The Aluminium Repair Tape is well as simple and fast and effektive without disassembly. The HARMFUL Tape Does Not Contain Asbestos.